Welcome to one of the most fun months of the year. October in Toronto is a glorious and gorgeous time. Not yet freezing, not too hot - perfect leather and scarf weather. Hot drinks and soups abound. And of course, it all leads up to the glory that is Halloween. With that in mind, there is no shortage of fun things to do this week. Check out the five events I'm most pumped for below. Is there anything better than spending the entire evening hand in hand with your love or all your best pals galavanting around the city while it's covered in art, the major streets are all closed to traffic, and the bars and subway are open late? Even if you hate how corporate it has become, the lineups, the creepy bros that are everywhere, or how packed the city gets - the pros far, far outweigh the cons. Is there any more awe-inspiring way to spend an evening than at a Cirque performance? It is seriously always motivating to watch incredibly fit and talented people live out their dream in such a fun, creative way. Every detail that goes into a Cirque show is so perfectly planned and executed - you can't help but leave the show feeling like your world has been expanded. Be sure to check it out before it heads over to San Fran and is gone for good. What better way to start a Friday evening than with your ladies, learning about the beauty of a California wine? Even better, classes take place at the iYellow Wine Cave which literally feels like a peaceful cave right in the middle of go-go-go Queen Street. The iYellow team is kind and informative - don't expect wine snobs! If you know nothing about wine, you're in good hands. They will teach you all you need to know to sound like a grape pro, without judging you for your love of a nice $6 strawberry wine. If you're up for something a little different this weekend, consider attending The Ghost Experience. I'm excited about this dinner theatre project, not just because I love dinner and theatre, but because I love Halloween, and I love to be scared. Located in an old bar on College street, a lot of history has taken place between those walls. It goes without saying that this one isn't for the faint of heart! 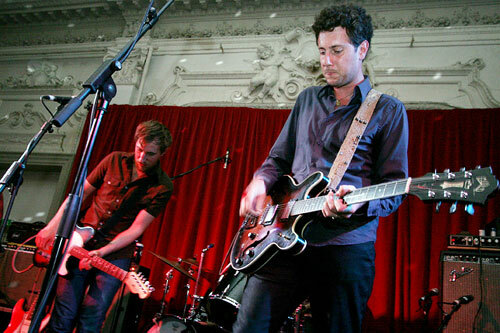 The very much reunited Constantines continue their tour of Toronto (they've played a hell of a lot here already this summer) with another two night stand, this time at the Danforth. Even if you're not one of their crazy, obsessive fans, you'll have fun at this show because the audience will be filled with crazy, obsessive fans singing along and soaking up every minute of it.